Doncaster Knights have announced a trio of new signings for the 2016/17 season. Centre Lloyd Hayes will arrive from neighbours Rotherham Titans and back row Jarad Williams will join from Yorkshire Carnegie. 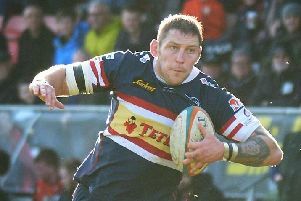 Irish lock David Nolan, who lists Connacht Eagles and French Pro D2 side Bourgoin among his previous clubs, has also put pen to paper on a deal at Castle Park. Director of rugby Clive Griffiths said: “Lloyd will add to us in midfield and he’s versatile as well, he can play on the flank and at full back as well.